I have always loved stuffed vegetables, and have been making variations of this recipe over the years. As my husband and I are trying to eat more vegetarian meals throughout the week, I have made some significant changes to my original recipe. I have let go of the ground meat, cheese and rice and used my new favourite ingredient: quinoa! Rather than the traditional tomato sauce, I have introduced a black bean sauce for a bit more protein and fibre. The ultimate result is a dish that is not only pretty to look at, it is delicious and healthy to boot! There is no end to what you can add to the quinoa stuffing, so let your imagination go wild! I’d love to hear your variations too! This dish was originally inspired by a recipe I found in Eat More, Weigh Less by Dr. Dean Ornish. Slice the tops off of peppers and scoop out the seeds. Place ½ inch water in a medium roasting pan. Stand the peppers upright in the pan and place in the oven, uncovered. Steam the peppers for 20 minutes. They will be tender, but still hold their shape when they are done. When cooked, remove from the water and drain any excess water from the peppers. Set aside. Rinse the quinoa in cool running water. Drain and place in a medium saucepan with water and salt. Bring to a boil. Cover and reduce heat to low. Cook on low for 10 minutes. Turn off the burner, but keep the saucepan on the element for 5 more minutes. Remove from element and fluff with a fork. Place in a medium bowl. Place raisins and sherry in a small saucepan and bring to a boil. Remove from heat and let stand for 10 minutes, until raisins are soft. In a medium skillet, sauté the onions in the olive oil until they are soft. Add the diced red peppers and sauté until soft. Add the garlic and cook until it becomes fragrant. Add coriander and cumin and cook for a few minutes, until it also becomes fragrant. To complete the stuffing, add the vegetable / spice mixture to the quinoa. Drain the raisins and reserve the sherry. Add the toasted pine nuts and chopped cilantro, and raisins. Set aside. In a medium skillet, sauté the onions in the olive oil until they are soft. Add garlic and sauté until it is fragrant; add spices and sauté until they are fragrant. Add 1 tablespoon of the leftover sherry and cook off the alcohol. Add the tomato purée and black beans. Gently cook this mixture over low heat for about 10 minutes. Remove from heat and gently stir in the vegetable sotck, orange rind and juice. Using a hand-held blender, blend the mixture until it becomes a smooth sauce. Add the cilantro and salt. To serve, fill each pepper with the quinoa mixture. 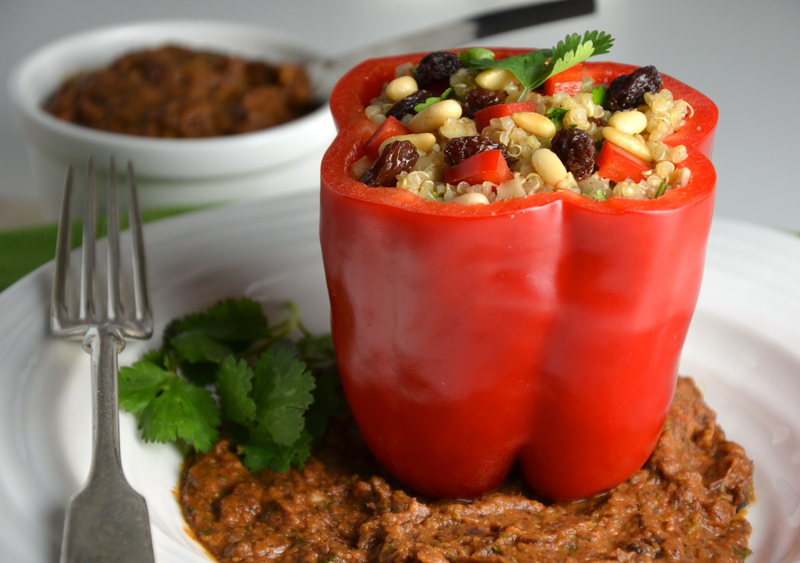 Place a few tablespoons of the black bean sauce in the bottom of a dish and place the stuffed pepper on top of it. You can garnish with more chopped cilantro and a few chopped fresh tomatoes if you wish. Enjoy! Thanks for taking the time to comment on this recipe, Geraldine! I hope you get a chance to try it out…maybe you have a very long list of appetizing recipes you would like to try since you have started blogging? I know my list gets longer every week… 🙂 Cheers! I made this recipe the other night and it was GREAT! I substituted cashews for the pine nuts (I don’t know how much they are where you live but here they’re, like, $100 for 2) and I added celery into the stuffing. All I can say is: fantastic recipe! Would definitely make it again! Wow, I am so glad that you liked this recipe! Yup, that’s how much pine nuts cost here too, but I had a little stash in my freezer, just waiting to be used. I don’t buy them much anymore, so the next time I make this, I will use cashews too. Thanks so much for the feedback – I really appreciate it!